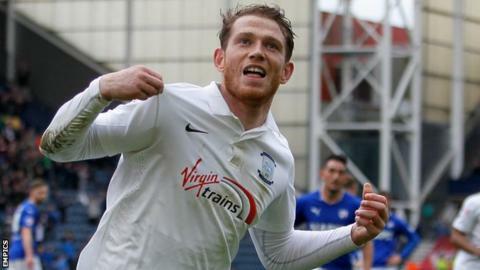 Preston North End striker Joe Garner has signed a new three-year contract, while former loanee Paul Gallagher has agreed a two-year deal. The pair helped Preston win promotion to the Championship via the League One play-offs last season. Former Watford forward Garner, 27, was League One's top scorer last season with 27 goals in all competitions. Gallagher, who has been on loan at North End for almost two years, has been released by Leicester City. The 30-year-old told the club website: "It was something I wanted to get done quite quickly and it's great that it's been done. "Being here last year, witnessing what happened and with the team spirit and the staff that we have here, it was a no-brainer." Garner, a boyhood Preston fan, added: "I'm over the moon to have signed. As soon as the offer was there, I didn't want to go anywhere else. "I'm happy here, I love the club and I'm just looking forward to next year now."